GPS Trailmasters has enhanced snowmobile and ATV trail navigation by developing a user friendly snowmobile and ATV trail map that is compatible with Garmin GPS devices. Our Garmin GPS maps are compatible with most Garmin GPS units. Our trail map data is also available in Google Earth's KMZ format, compatible with GPS apps on smart phones and tablets. Our GPS trail maps for ATVing and snowmobiling are compiled from tracks recorded using a handheld GPS. These tracks are then edited to add trail names and line styles (color, thickness, pattern, etc) to help identify one trail type from another. The data is compiled into a transparent trail overlay that when added to your Garmin GPS, shows the color-coded trails overlaid on top of our basemap or the basemap that comes with the GPS. 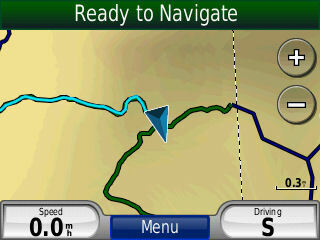 Our Garmin GPS trail maps will give turn by turn directions just like the GPS maps used in your car or truck. See the actual trails, trail names and color-coding for our US and Canada Snowmobile maps and our New England ATV trail maps. 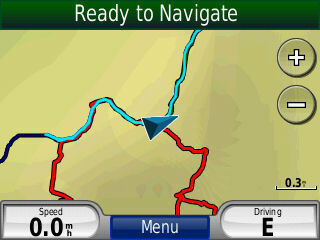 "Auto-routing" or "Turn-by-turn" navigation is a capability that is built in to your Garmin GPS. All automotive and many handheld GPS units have this capability. The routing capability requires a map that contains routing information such as speed limit and node information where two or more roads or trails intersect. The City Navigator maps from Garmin are routable maps for streets and similarly our GPS maps for snowmobile and ATV trails are "routable". Based on trail use, we can apply a reasonable speed limit to each trail type. The speed limit is used by the Garmin routing algorithm to calculate time of arrival. It's also used for calculating routes with "fastest time". 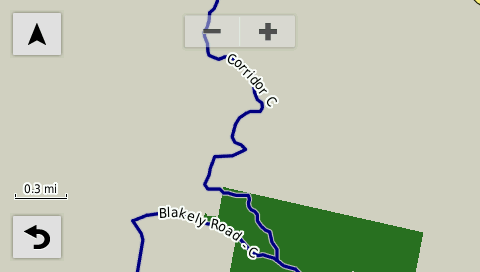 The screenshots below illustrate a route by snowmobile trail calculated by the GPS. Read about base maps to understand how routable GPS trail maps are impacted by routable GPS street maps installed on the same GPS. All the maps we sell include both state and club level trail systems. Our trail maps do not have EVERY snowmobile trail in existence but our snowmobile trail maps currently combine to cover over 27,700 miles of primary, secondary and club trails in the northeast United States and over 17,300 miles (27,800 km) of provincial and local trails in Quebec and New Brunswick Canada. Combined, our maps include over 4,000 points of interest for trail accessible services (fuel, restaurants, lodging, snowmobile sales, scenic views, trailer parking and snowmobile club houses and warming huts). Watch the video or read further to learn about the line styles used to develop our snowmobile trail maps. During map development we assign each trail a unique “line type”. We use different line types for a primary trial, secondary trail, club trail, lake crossing trail, plowed/shared access road, ungroomed trail, closed trail and an approximated trail. For your safety, a yellow/black warning line style for shorelines has been added to every lake crossing. The yellow/black warning stripe line style is designed to warn you when you are approaching the shoreline. The warning stripe indicates you are within 350 feet of the shore. The warning line style provides added safety at night and in poor visibility conditions often encountered when snowmobiling across large lakes. The illustrations below show the 350 foot safety buffer. Snowmobiling across lakes can offer some extraordinary scenery and is a great way to explore. Lakes and ponds throughout New England are critical to many trail systems, often times it’s the only way for snowmobiles to travel through these areas. The most difficult aspect of crossing lakes is finding the trail head to get off the lake. It is particularly difficult at night, on large bodies of water and in poor visibility conditions. The yellow/black warning track is combined with the red/white lake crossing line style to make snowmobiling across lakes both safe and enjoyable. Always make sure a pond, lake, river or other body of water is safe before driving your snowmobile on it! Our trail maps have been designed by a New Hampshire native with 15 years’ experience snowmobiling in Maine and New Hampshire. We are constantly thinking of new ways to improve our product for our customers. With the rider in mind we have color-coded our trails to provide a consistent nomenclature to quickly recognize the trail type you are on and easily navigate to your destination. We also identify each trail by its trail type and name/number. The New Hampshire snowmobile trail maps use the Corridor # and Primary # conventions established by the New Hampshire Snowmobile Association and we have added club level trails. The screenshots below show examples of the line styles used for our NH snowmobile trail map on a Garmin Nuvi 500 GPS. Trail names and numbers are displayed at different zoom levels, depending on your model GPS. 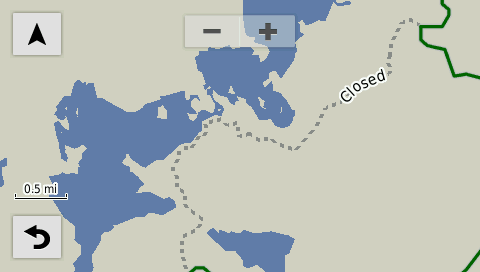 Most units won't display the trail names until you are zoomed in quite close. The handheld models allow some customization for setting when labels and map points are displayed. 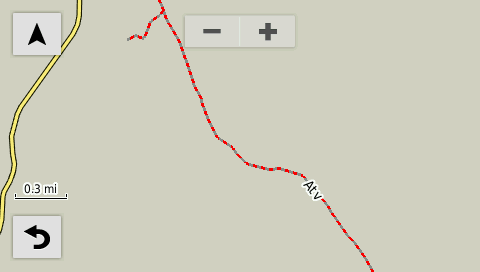 The trail name will also be displayed if you move the mouse cursor over the trail or click on the line. 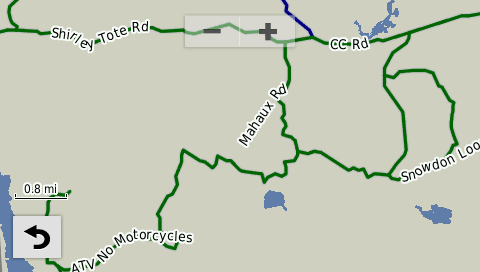 Our Maine snowmobile trail maps use the ITS # naming convention established by the Maine Department of Conservation. Our Vermont snowmobile trail maps use the same naming conventions as the map published by the Vermont Association of Snow Travelers (VAST). The New York snowmobile trail map uses trail naming conventions similar to the paper map published by the New York State Parks, Recreation and Historic Preservation. Our Pennsylvania snowmobile trail map uses trail names adopted by the PA Department of Conservation and Natural Resources (DCNR). Our snowmobile maps indicate lake crossing trails where under the proper conditions a snowmobiler has crossed. These trails are identified as red/white striped trails and labeled as Danger. You should always be sure the ice is safe before attempting one of these lake crossing areas. Lake crossing trails provide valuable navigation on large expanses of ice. These trails can be navigated directly to the trail head exit point. The snowmobile GPS trail map only provides the path across the lake. The lake image comes from your Garmin factory installed street map, basemap or third party topographic map. Our X Package includes a detailed topo-like Garmin compatible background map with accurate reference for lakes, ponds, rivers, streams, railroads, power lines and other features. This background map can be installed on your GPS as your background reference map. The background map is not a routable map so it won't interfere with the snowmobile GPS trail map when attempting to auto-route. The figure below shows the red/white candy stripe line style for lake crossing. Trails that are open for snowmobiling but plowed during the season are uniquely marked in a solid brown line style. These trails may return to normal groomed trails at some point during the season. The image below shows a plowed section of ITS 84 in Maine. Small sections of plowed road is normal for New England snowmobile trails but when you see a section of 5 or 10 miles of plowed road, it often indicates a logging operation and should be avoided if possible. GPS Trailmasters is the first to identify closed trails on their GPS maps. In New England, private land owners often close trails for logging. You may have ridden these trails the season before but find yourself stuck the following year. We have identified these trails as light gray dotted lines with the label Closed. Because our information comes from the riding population and news articles, the reopening of these trails may not be in the latest map update. If the trail is clearly groomed and in use, you will still be able to navigate the trail and the GPS will indicated where it goes. If the snowmobile trail is not groomed, regardless of whether you see snowmobile tracks you should consider the trail closed and not ride it. Our snowmobile trail maps for ME, NH, VT are the most current, most accurate and include more miles than any other product on the market. Our snowmobile trail maps for NY and PA continue to expand and cover more state and local trails. Our snowmobile tail map of Quebec Canada, includes trails in northern New Brunswick and is also expected to expand with time. We are able to edit our maps and distribute updates to our users within a couple weeks’ time. Most of our trails have been tracked by GPS within the past 3 years. There are some trails that have been approximated (not actually tracked by GPS). We identify those trails uniquely as a blue/white trail and the label Approximate. In these cases, your position may not be directly on the line when navigating the trail. The main thing to recognize with an approximated trail, or any trail for that matter, is the intersection points or the end points. You will be able to navigate effectively traveling from intersection to intersection even if the trail between intersections is off the mark a bit. We recognize people like to explore and that not all trails are groomed. This can be for a couple reasons; the trail is too tight to get a groomer through, the trail is not often used and a club chooses not to groom it or the trail is not groomed for economic or environmental reasons. These trails are uniquely identified by a grey/white striped line style. The trail referred to as "The Trains" in the Moosehead Lake region is one of these trails. ALWAYS check to make sure your riding area is authorized for OHRV use! Our snowmobile GPS trail maps are used primarily the same way a GPS is used in your car or truck. As you ride down a trail, your position is always shown on the map. As you come to an intersection, you will see your position on the GPS and be able to decide whether you need to turn right or left to get where you’re going. Most GPS units provide a trip log that allows you to track where you have been. When enabled, your trip log is shown in a different color. You can use this feature to back track to your original starting point. The trip log is also handy when you get turned around and lose your bearing. The trip log can also show a subtle veering off course. Since we don’t claim to have every single trail on our snowmobile GPS maps, you may start down a trail that appears to be on the map but as you get farther and farther down the trail, your trip log path will diverge from the trail that is showing on the map. In this case you know you are on a new trail and should either turn around to get back on the correct trail or be adventurous and keep riding the new trail. We ask that you send us the trip log data when that happens so we can update the map. Our GPS maps, like your automotive GPS, have hundreds of searchable points of interest for locating places to eat and refuel. Our ATV maps currently cover 7,320 miles of primary and club trails across Maine, New Hampshire and Vermont and 795 trail accessible points of interest. The trails on our ATV GPS maps are color-coded to identify permitted use for different types of OHRVs. Our "permitted use" line styles distinguish between quad-type ATVs, larger 60" UTV/side by side machines and trail bikes. The color-coded trails help identify locations where your OHRV may not be permitted. We also label every trail with the road name or trail name if known, otherwise a generic "ATV" type label is applied. ATV trails that are permitted for 60" wide UTV/side by side machines are green. When trail bikes are also permitted the green line style will include a grey stripe. ATV trails that do not allow the wider side by sides are red. Again, if trail bikes are also permitted, the red line style will include a grey stripe. These four line styles are summarized and illustrated below. Solid Green = UTV, ATV No Trail Bike. Green/Grey = UTV, ATV and Trail Bikes permitted. Red = ATV Only. Red/Grey = ATV and Trail Bikes permitted. Dark blue is used to indicate a club trail and yellow/black striped line styles indicate a town or city access trail. Closed trails are represented as a grey dashed line. We also highlight the New Hampshire "Ride The Wilds" corridor trails as a thicker bright blue line style. The screenshot below shows city access trails in and around Pittsburg NH with icons for food, lodging and trailer parking captured from a Garmin Montana 600 GPS. Our snowmobile and ATV trail maps for Garmin GPS, iOS and Android devices include hundreds of Points of Interest, identifying on-trail parking, gas, food, lodging, club houses, repair shops, and scenic views. Use our extensive list of POIs to locate services in a pinch. Just as you would in your automobile, the Garmin "Where To?" feature can be used to auto navigate to these points. When the "Where To' feature is pressed, a list of categorized POIs are display as in the middle screenshot below. If you are looking for gas, press the "Fuel" icon and you will be shown a list of gas stations ranked in order of closest distance first. You can either select the point of interest and press "Go" to start auto-navigation or you can select the POI and view its location on the map before deciding to calculate a route to that location. Most Garmin maps contain thousands of map POIs, each with its own type of map symbol. If all these map symbols were displayed on the map, it would result in a blob of unrecognizable information covering any roads or trails that are in that area. For this reason, the Garmin firmware only displays map point symbols at very close zoom levels so there is enough separation between streets, trails and other map points. The zoom level at which POIs are displayed is dependent on the model of your GPS. The display zoom level is configurable on some Garmin GPS models and is typically set for around 300 ft. The intended use of map POIs is not to search for their symbols on the map but to use the “Where To” feature and let the Garmin firmware find them for you. This approach works quite well and provides a filter mechanism that gives you the option of searching all POIs or narrows your search to just gas stations or just food. The Garmin firmware returns a list of POIs in order of their distance from your current location, closest POI is listed first. Each POI is listed with their distance from you. The POI can be selected for display on the map or for auto-routing. Having the ability to inspect the location on the map provides the opportunity to verify how close it is to a tail and how accessible. There may be a better option in the list. Our snowmobile and ATV trail maps include a POI database that is searchable whenever the trail map is enabled on the GPS. Similarly, the factory installed basemap that comes with your Garmin also has a POI database that is much more extensive than our “trail accessible” database. The Garmin factory database can also be searched and used in the same way by enabling the factory basemap. Ideally, you would create your own waypoint for a POI in the factory database, then disable the factory map and use the trail map to get turn-by-turn directions. The POI may or may not be trail accessible. Our snowmobile and ATV trail maps for Garmin are designed as an overlay map which means the lines that represent trails and the symbols that represent points of interest are displayed on top of the factory supplied base map that comes with your Garmin GPS. Most Garmin’s are able to have multiple maps installed at the same time but that doesn’t mean that all these maps can be displayed at the same time. Most Garmin maps are raster type images that when displayed on the GPS will hide any other map that may be present. If multiple raster type maps are installed on the same GPS only the last one drawn will be shown. It is unpredictable as to the order in which these maps are drawn but experience shows that the factory supplied Garmin maps are usually drawn first followed by any supplemental maps that reside on the GPS. Our GPS trail maps are vector type maps which allows any underlying map to remain visible underneath. Without a base map as a reference, the trail maps would be nothing more than a network of lines with interconnecting nodes. Although this network would be an effective map for navigating snowmobile and ATV trails, it is not ideal for understanding the larger context as well as your current relative position to highways, power lines, back roads, lakes, ponds and rivers. Having this relative context can be very helpful out in the wilderness. If you are using an automotive GPS for the trails, your base map will most likely be the routable street map that came with your GPS. If you are using an outdoor or handheld GPS for trail riding, your base map may be the factory Garmin map which will have limited resolution or it may be a factory topographic map or possibly a third party topographic map. These maps are not usually “routable”. When multiple routable maps are installed on the GPS at the same time problems will occur. The Garmin GPS software now has multiple networks to deal with, a trail network and a street network. The two networks are independent in that none of their intersecting nodes are the same but how does the software know which network the operator wants to use. At times you can get away with it, for example if you are in a remote wilderness area where there are very few roads. There are other conflicting elements to having two routable maps at the same time. The points of interest (gas, food, etc) from the two maps are combined into a larger list of POIs. This is not necessarily a bad thing and you may actually want to take advantage of both POI databases if you are in trouble and can’t find the services you need on one, you can check the other. Keep in mind that the POIs which are integrated into the trail map are (mostly) trail accessible. Many GPS units are capable of displaying the trail name that you are currently riding at the top of the display. 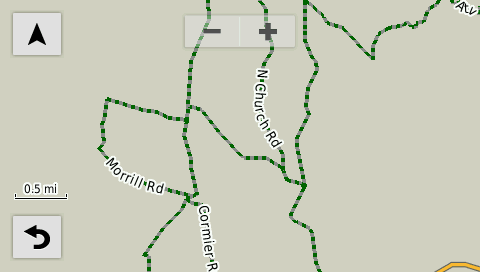 If two routable maps are enabled on the same GPS, this feature is not well behaved. Garmin provides a menu which lists all the maps installed on the GPS and gives you the ability to turn them on/off by enabling or disabling each map. We recommend you disable the Garmin installed routable street map when using our ATV and snowmobile GPS trail maps. Our X Package products come with a detailed Background Map that can be used as the base map, replacing the Garmin routable street map. Our Background Map is not a routable map so it won’t interfere with the Garmin routing software. This map is a raster type map and will display over other maps such as a topographic map. Our map making process starts with raw tracklog data collected with a GPS. Each trail on the map must be ridden by someone carrying a GPS and recording a trip log, also called a tracklog. Most of the tracklog data comes from our large customer base after a day or weekend riding the trails, so the data usually has redundant tracks from riding the same trail out and back or riding the same trail on different days. The tracklogs that we receive must be edited to remove redundant tracks. Every GPS records data slightly differently, some record with very high resolution, some not. Some GPSs record at a set time interval while others record at a set distance interval. Time interval recording generates large clusters of points in the same spot when the rider is not moving. These clusters are edited out. For auto-routing to work properly, every intersection must be “closed” without any small gaps where the trails intersect. There are other requirements for intersections as well that must be maintained. Every trail intersection is edited to be compliant. Trail names have to be applied along with a line style to give the trail a color and width to indicate a primary, secondary or club trail. This part of the process often requires a fair amount of research and cannot be performed by a computer. This is where we excel and separate ourselves from other GPS and smart phone map developers. The other half of the editing process deals with the map points of interest (POI). Map POIs that are trail accessible is a key feature of our maps. Often times we receive tracklogs identifying the access to a gas station or restaurant but we don’t get a waypoint identifying the location (what is the name, is it gas, food, lodging?) or is it a private access to a camp or residence? Google Maps and Google Earth are used to try and identify the location. This process is also very time consuming. The map editing process is the most time consuming part of the map update process and usually takes about two weeks to complete with a large number of tracklogs to process. Once the editing process is completed, the map is then compiled into Garmin IMG format and a product build sequence is performed and updated map installers are created with the next version number. This part of the update process takes about one day. We therefore have the capacity to turn out a map update every two weeks. GPS maps have the distinct advantage of being changed very quickly. After the map update process is completed, the new map installers are uploaded to our website server and available for our customers to download from their GPS Trailmasters’ website accounts. Map updates for X Package products are free for 2 years and Smart Phone Data products are free for 1 year from the date of purchase. During this free update period, there is no limit to the number of times your map installer can be downloaded. Our maps are priced by the mile. The reason for this is the amount of work to generate and maintain a Garmin compatible GPS map is directly related to the number of trails. We also attempt to remain competitive. We believe we have the BEST product on the market, however if you find a map that has more trails and is more accurate we will match the price.